Made in 85% cotton 15% elastic fibers.Machine wash in cold water; Dry flat. Perfect for studio, home, traveling ,dancing and more use. 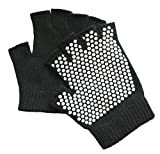 Made on high quality cotton and elastic fibers , they are the ideal companion for your yoga exercising routines, giving you maximum balance and stability while protecting your hands.The Gloves make yoga or Pilates easier, whether you¡¯re a hot yoga fan, practice your poses on the carpet at home, or struggle with sliding in poses. The open-finger, non-slip design reduces slipping for better balance and stability . So no mat required!